Strength training has the potential to reduce muscle weakness and improve walking ability of children with cerebral palsy (CP), but should be adapted to each child’s muscle response, according to a study published in the Journal of Motor Behavior. Researchers at the Colorado School of Mines and the University of Nebraska Medical Center evaluated the effects of a conventional strength training intervention — focused on strengthening lower limbs — on walking ability for children with cerebral palsy. They assessed the effects of strength training on walking speed, measured by the 10-meter walk test, and endurance, assessed by the six-minute walk test. Joint strength was also measured using a device called a dynamometer. Musculoskeletal simulations were performed to study the children’s gait pattern and evaluate the effects of strength training on dynamic muscle forces and their contributions to whole body motion, specifically propulsion and support during walking. The strength training program combined exercises for the hip flexors and extensors (muscles involved in hip flexion and extension), knee extensors, and ankle plantar flexors (muscles responsible for the plantar flexion of the foot). 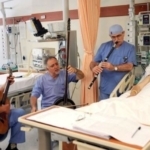 The program was performed three times a week for six weeks. This protocol had previously been found to improve walking speed in children with cerebral palsy. A total of nine children, at a mean age of 14, with spastic cerebral palsy — the most common type of cerebral palsy — completed the entire strength training program. The program led to significant increases in joint strength in all muscles targeted. However, this improvement did not reflect significant changes in walking speed or endurance; some children experienced small improvements in their walking ability, but overall these were not significant. “We suspect this discrepancy may be because the orchestration of muscles together to produce force, instead of maximum muscle strength, is likely more important for mobility improvements for these children,” the researchers wrote. A group of four children was selected for the musculoskeletal simulation analysis. 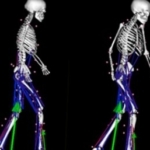 The children’s gait was computer-modeled, based on video tracking and ground reaction forces — the force exerted by the ground on the body — before and after the strength training protocol. The simulations revealed that strength training improved dynamic muscle forces during walking, with a greater effect in hip muscles (specifically the iliacus and the gluteus medius). The children had a range of responses to the training. Two had marked improvement in strength and walking endurance, while one child had only moderate improvements in strength with limited improvement in mobility. A fourth child experienced a small reduction in strength but a considerable improvement in walking speed. 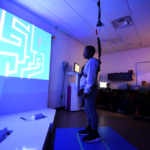 The gait simulations provided insights on children’s muscle behavior, which was not apparent from strength tests “and can be used to explain changes in clinical mobility outcomes,” according to the study. Functional outcomes of strength training in spastic cerebral palsy, Damiano DL, Abel MF. Arch Phys Med Rehabil. 1998 Feb;79(2):119-25. Changes in Mobility and Muscle Function of Children with Cerebral Palsy after Gait Training: A Pilot Study, Hegarty AK, Kurz MJ, Stuberg W, Silverman AK. J Appl Biomech. 2016 Oct;32(5):469-86. doi: 10.1123/jab.2015-0311. Epub 2016 Aug 19. 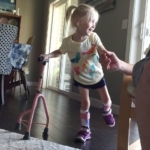 Changes in lower extremity strength may be related to the walking speed improvements in children with cerebral palsy after gait training, Hoffman RM, Corr BB, Stuberg WA, Arpin DJ, Kurz MJ. Res Dev Disabil. 2018 Feb;73:14-20. doi: 10.1016/j.ridd.2017.12.005. Epub 2017 Dec 12. Interaction between muscle tone, short-range stiffness and increased sensory feedback gains explains key kinematic features of the pendulum test in spastic cerebral palsy: A simulation study, De Groote F, Blum KP, Horslen BC, Ting LH. PLoS One. 2018 Oct 18;13(10):e0205763. doi: 10.1371/journal.pone.0205763. eCollection 2018. A spasticity model based on feedback from muscle force explains muscle activity during passive stretches and gait in children with cerebral palsy, Falisse A, Bar-On L, Desloovere K, Jonkers I, De Groote F. PLoS One. 2018 Dec 7;13(12):e0208811. doi: 10.1371/journal.pone.0208811. eCollection 2018.